It’s almost my favorite day of the year… FREE COMIC BOOK DAY is Saturday, May 7! The reason I dig this holiday so much is because it brings comic lovers together all over the U.S. to celebrate the medium. Don’t get me wrong, conventions are a ton of fun, but with so many celebrities, T-shirt vendors, cosplayers, toymakers in the aisles, sometimes it’s hard to find people who are there for the comics. During Free Comic Book Day, everyone is there for the comics. Not only are they there to scoop up free titles, but it gets new people into the shops and gives them an opportunity to see how much fun the experience can be. Each year for the past three years I’ve been fortunate to be invited to spend the day at Arena Comics and Gaming, a fine comic book shop in Panama City, Florida. And I’ll be back this year starting at 10 a.m. CT. The event gives me an opportunity to meet and greet with the local comic-reading community, fellow writers and artists and the very nice people who run the store. I’m floored at the amount of support I get each year from people willing to toss down a couple bucks to pick up my crazy comics. It reminds me that all this hard work and rejection is bringing people joy. It’s an awesome experience. This year I’ll join my pals Andrew Pate (colorist of my upcoming comics Edison, The Rocking Dead and 90 other things we’re not talking about yet) and Jayson Kretzer (artist/writer of Wannabe Heroes and my comic The Rocking Dead) who are two of the nicest people on planet Earth. If you’re not able to come and get high fives from us, go to your local comic shop, meet the creators, pick up some free comics and maybe buy yourself a little somethin’ somethin’ to help support the shop. Then maybe go back the following Wednesday and buy some new comics. Then go the week after that until you’ve developed a habit you can no longer control. What will I be stocking at FCBD2K16? I’ll be armed to the teeth with copies of Unit 44, The Undoubtables, Chambers, Maintenance, The Temporal, Hipsters Vs. Rednecks, and issue #1 of Edison! Don’t miss out! 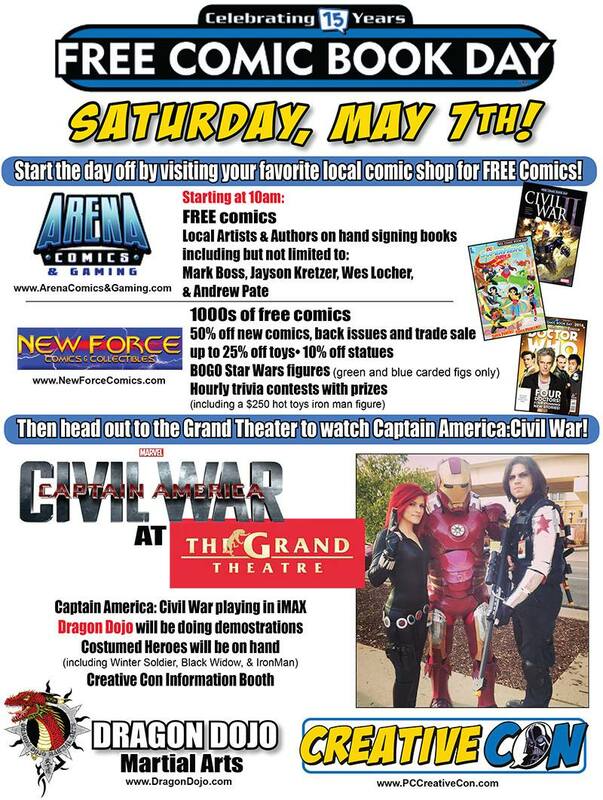 Each year since 2002, the first Saturday in May is also known as FREE COMIC BOOK DAY! In an effort to thank current readers and draw in new ones, publishers big and small give out thousands of comics at shops across the world to show what this amazing medium is capable of. Whether readers are into superheroes, cartoons or fun indie books, there’s always something for everyone. To further support the comic industry, many shops welcome creators, both big and small, to their shops for signings, commissions and meet and greets. 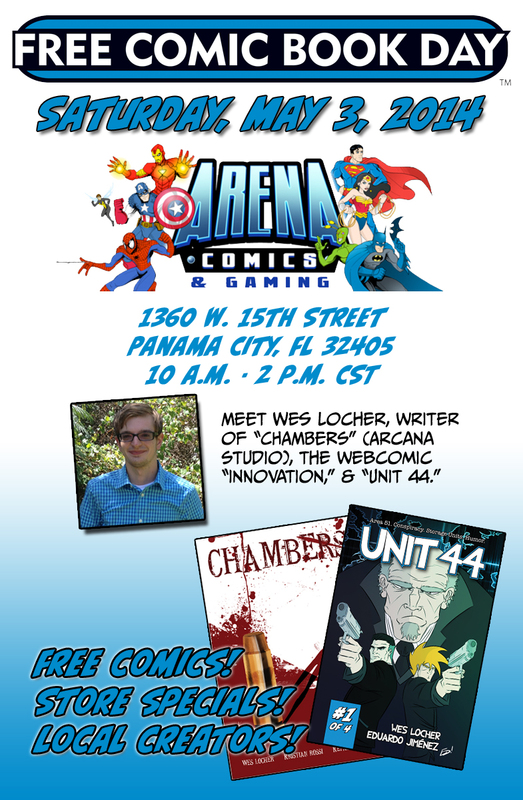 Once again I’ve been invited to spend Free Comic Book Day with the fine folks at Arena Comics and Gaming in Panama City, FL. I’ll be joining my pal, writer/artist Jayson Kretzer to celebrate the event. He’s celebrating the release of issue #2 of his (hilarious) series Wannabe Heroes and sketching up all kinds of fun stuff. I’ll have all of my leftovers from MegaCon 2015, which will include physical copies of Unit 44 #1 & #2, The Undoubtables graphic novel, the Chambers trade paperback, and my black and white one-shots, The Temporal and R.D.S.L. Chronicles #1. While our comics won’t be free, Jayson and I will engage you in polite conversation and those always-entertaining “who would win in a fight” arguments. If you’re in the area, come say hello this Saturday between 10 a.m. and 2 p.m. Central Time. Grab some free comics, take advantage of the store specials, and meet some folks who work hard to create the funny books. You can RSVP for the event on Facebook if you’re into that by clicking here! To further support the comic industry, many shops welcome creators, both big and small, to their shops for signings, commissions and meet and greets. I was lucky enough to have been invited to spend Free Comic Book Day with the fine folks at Arena Comics and Gaming in Panama City, FL. I’ll be joining several other creators to celebrate the event and I’ll be selling copies of the CHAMBERS trade paperback as well as the first issue of UNIT 44! A little something for everyone!